In a way, the amusing, preposterous Hail, Caesar!, for all its arch postmodernism, becomes what it pastiches, resembling the kind of '50s film we can now watch and admire for a kind of cultural reflection without exactly considering it a success. 106 min. Universal Pictures. Directors: Ethan Coen, Joel Coen. Cast: Josh Brolin, George Clooney, Alden Ehrenreich, Tilda Swinton, Ralph Fiennes, Scarlett Johansson, Channing Tatum, Jonah Hill, Frances McDormand. An Eastern Orthodox clergyman, a Protestant clergyman, a Catholic clergyman, and a rabbi walk into a board room. That's just one of many joke setups in Joel and Ethan Cohen's latest comic lark, Hail, Caesar! Of course, one man's lark is two men's excuse for a stealth fable and cheeky, impeccable, virtuosic visuals—in this case both dealing with 1950s Hollywood. And so it is that the further gag setups include a cabal of Communists, gossip around an unplanned pregnancy and a gay scandal, and a string of elaborate period pastiches: an Esther Williams' style bathing beauties musical, a singin' cowboy movie called "Lazy Ol' Moon," a sailor-themed musical called "No Dames! ", a swanky drama called "Merrily We Dance," and the centrally positioned Biblical epic "Hail, Caesar! A Tale of the Christ." The board room in question resides on the lot of Capitol Pictures, the same studio in the Coens' 1941-set Hollywood nightmare Barton Fink. 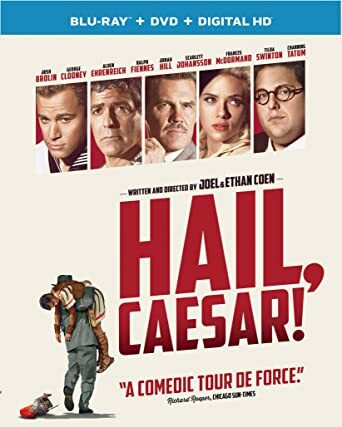 The religious leaders have been assembled by studio executive/"fixer" Eddie Mannix (Josh Brolin) to discuss an endorsement of—and forestall any protest against—Hail, Caesar! It's the rare task Mannix can accomplish with ease (if bemusement). His biggest hassle over the 27 hours essayed in Hail, Caesar! concerns the kidnapping of "Hail, Caesar! A Tale of the Christ"'s star, Baird Whitlock (George Clooney). Mannix was a real, and notorious, figure, but the Coens' fictional family-man version of him isn't a ruthless cynic so much as a thoughtful believer in serving the Dream Factory. Despite all the greed and all the lies, Hollywood is a dream we all choose to have together, and emotionally invest in. We need our illusions. Without them, all we'd have is the cold, hard truth. Ominous truths lurk all around Mannix, and it's his job as "Head of Physical Production" to hide them from the likes of twin gossip columnists Thora and Thessaly Thacker (both played by Tilda Swinton), caricatures of Hedda Hopper and Louella Parsons. Such thinly veiled allusions pervade Hail, Caesar!, which will make it especially satisfying for the TCM "classic movie" crowd. It's hard to know if anyone else would care about this defiantly esoteric picture, obviously made more for the Coens' own amusement than anyone in the audience. There's a direction offered by gay director Laurence Laurentz (Ralph Fiennes) as he tries to class up aw-shucks cowboy star Hobie Doyle (soon-to-be "young Han Solo" Alden Ehrenreich): to cough out "a mirthless chuckle," and that's mostly the type of laughter one can expect, sparsely, from Hail, Caesar! And yet, the picture's somewhat awkward tone doesn't dim the pleasures of its performances and pictorial splendor. The Coens' gang's all here: cinematographer Roger Deakins, costume designer Mary Zophres, production designer Jess Gonchor, and composer Carter Burwell, not to mention a typically deep, deep bench of just-so character actors. In a way, the amusing, preposterous Hail, Caesar!, for all its arch postmodernism, becomes what it pastiches, resembling the kind of '50s film we can now watch and admire for a kind of cultural reflection without exactly considering it a success in its own mercenary goals: to sell scads of tickets and, if possible, emotionally move an audience to sadness or "mirth." Universal delivers Hail, Caesar! to home theaters in a satisfying Blu-ray + DVD + Digital HD special edition. A/V specs are fantastic. The picture quality captures all the richness of color and subtlety of light from the film source (yes, film! some filmmakers still use it from time to time), amounting to a clean, stable, and natural-looking image with light grain but nary a sign of digital artifacting. Contrast and black level are spot on, and plentiful detail and textures (a particular hallmark of the Coen production team) contribute mightily to the film's period look. The lossless DTS-HD Master Audio mix doesn't miss a trick, contributing clear dialogue, subtle immersion on film sets and in exterior sequences, and kicky music, especially during the song-and-dance sequences. In bonus features, four fine featurettes dice up what's essentially a pretty cool 28-minute making-of documentary. The best thing about these featurettes is the wealth of behind-the-scenes footage of the Coens directing the production, but we also get some interesting comments from the talent in talking-heads interviews. The more-or-less self-explanatory featurettes comprise "Directing Hollywood" (4:11, HD) with George Clooney, Channing Tatum, Tilda Swinton, Alden Ehrenreich, Ralph Fiennes, Josh Brolin, executive producer Robert Graf, Scarlett Johansson; "The Stars Align" (11:34, HD) with Clooney, Tatum, Swinton, Ehrenreich, Fiennes, Brolin, Graf, and Johansson (and screenplay excerpts! ); "An Era of Glamour" (6:22, HD) with Graf, production designer Jess Gonchor, costume designer Mary Zophres, Tatum, Clooney, Brolin, Fiennes, Swinton, and Johansson; and "Magic of a Bygone Era" (6:01, HD) with Johansson, Tatum, Graf, "No Dames!" choreographer Chris Gattelli, Clooney, Brolin, and swimming choreographer Mesha Kussman. All site content © 2000-2019 Peter Canavese. Page generated at 04/17/2019 10:48:44PM.